The Bulls Thursday with a 94-87 victory concluded the rare double of defeating the reigning NBA finalists, the Cleveland Cavaliers and Golden State Warriors, within a week. The Bulls got 22 points and 10 of 10 from the free throw line from Jimmy Butler and 17 points and 13 rebounds from Bobby Portis. Dwyane Wade added 12 points and Robin Lopez had 10 points. Stephen Curry had 23 points, but shot 10 of 27. The Warriors were six of 30 overall on threes and shot 38.6 percent. The Bulls moved to 31-30 and Golden State fell to 50-11 and lost their second straight regular season game for the first time since April 2015. It was the Bulls 18th consecutive home win when the game was televised on TNT. Michael Carter-Williams still was out, but close to a return for the 15-man roster. The excitement in the United Center was palatable with the Warriors now the primary road show in the NBA even with Kevin Durant out injured. But Curry remains perhaps the league’s most popular player and received a huge pregame ovation. The Bulls got off to a good start with Portis hitting a three and finishing a Butler miss after a steal by hustling up court. The Bulls took an 11-8 lead to the first timeout. But it was another poor Bulls shooting start against a Golden State team that has been poor defensively of late. 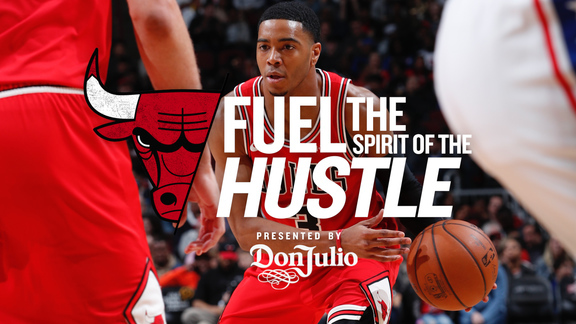 The Bulls shot 37 percent and committed six first quarter turnovers and trailed 26-19 after one even with Golden State shooting 39 percent in the quarter. Butler and Wade were a combined two for seven. The offense continued to be mostly silent to open the second quarter other than a pair of runners from Cameron Payne. The Warriors on Klay Thompson backcuts moved out to a 32-23 lead three minutes into the second quarter. Portis continued to excel with a big first half of 14 points and six rebounds to get the Bulls within 36-34 on a runner and finish of a Wade pass. Golden State got a Thompson three, but then Butler began pushing his way to the basket for six straight points. The Bulls got within 51-47 at halftime with Butler adding 12 points. The opened the second half with fortuitous defense in the passing lanes with a Butler steal on Curry leading to a slam dunk and a Portis block on Klay Thompson preceding Jerian Grant sending Curry stumbling to the floor on a crossover move and three for 59-58 Bulls lead four minutes into the second half. Second shots were crucial as Curry got a Thompson miss on a long rebound for a three and 63-59 Golden State lead midway through the third. The Bulls took over the quarter from there to a 79-73 Bulls lead after three quarters. The Bulls ran off 10 straight with Portis scoring on an inbounds pass with a second left and a driving score on a Butler pass. Rajon Rondo followed that with a pair of drives for a layup and free throws as the Bulls closed the third quarter on an 18-8 run. The Bulls unveiled that stagnant offense to start the fourth quarter, settling for long jump shots and five straight misses and a turnover when they could have gained a big lead as the Warriors couldn’t get much going. So with six minutes left in the game, the Bulls were holding onto an 84-83 lead after another Curry second shot score. Neither team could get much going offensively in the fourth quarter with Payne and Wade each with a pair of turnovers while Golden State had missed 19 of 25 threes. With 2:53 remaining, the Bulls were hanging onto an 86-85 lead. But they got a Paul Zipser three as the shot clock expired for a 91-85 lead with 1:41 left.